People have wanted to know the origin of all, for as long as the historical record shows, and probably much longer. We have not always had the means to study, nor the tools to examine the first moments of time, however. To study the very beginning, in an attempt to discern the origin of the universe, we must leave behind some of our conventional notions about time, space, and distance, and develop a more flexible framework of dimensionality. This is something that many physicists, including advocates of both String Theory (or M-Theory) and Loop Quantum Gravity, all seem to agree upon. Theoretical physicists of all persuasions know that, in the realm of exceedingly small size, the ordinary laws do not apply and the natural forces seem to all converge into one force. So; scientists have been working diligently, for almost 100 years now, to elucidate the nature of that realm. The study of the Mandelbrot Set, with the perspective of this theory, may allow us to understand more fully what we cannot hope to directly observe. We can examine the conditions at the very origin of the universe, using the Mandelbrot Set. 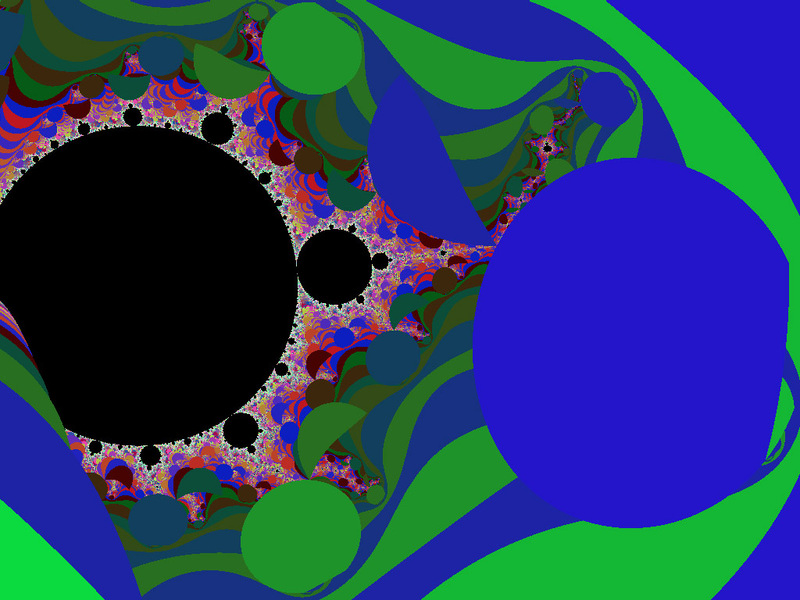 At the start of my explorations into a Cosmology based upon the Mandelbrot Set, I was trying to make it fit the concepts and tone of Big Bang theory, or what has become the Standard Model of Cosmology. Along the way I learned about Inflationary Universe theories, and how they avoid some of the complications created when one tries to apply the Big Bang model in combination with the Standard Model of Particle Physics. More recently, I have come to grasp why Inflationary theories can avoid some of those complications, and I have also learned why a Cosmology derived from the Mandelbrot Set must be framed as, or considered an Inflationary Universe theory. It is my current working hypothesis that the Mandelbrot Cosmology describes how 2-dimensional space curves toward the 3rd dimension, creating broken symmetry and a universe of form along the way. This insight is causing me to re-write this essay, little by little, to incorporate and reflect my new hypothesis. 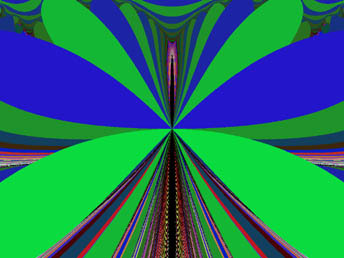 My present understanding is that the early universe arose from a noncommutative space, and that the Mandelbrot Set was a natural outgrowth of the process by which the property of commutativity arose in the pre-bang era. Modern Cosmology can give us insight into events that happened a long, long time ago, in the first few moments after time began. The detailed analysis of new observational data from astronomy, radio-astronomy, and measurements of the Cosmic Microwave Background radiation, can tell us a lot about the early universe Combining this with data from high-energy particle physics, we can surmise what must have happened from a small fraction of a second onward, to create the universe we observe. What about the beginning itself? Did the universe actually begin with the beginning of time? Is that where the story truly begins, or was there some pre-existing potentiality which shaped and molded the forms things could assume? What were the forces which actually gave birth to the Universe, and how may we best understand them? Some of the answers may lie with the Mandelbrot Set, or in the Mandelbrot Fractal Butterfly figure, and its family. Modern Science has fostered much speculation, and continues to push the clock back so we can see further into the past, but even the most powerful theories deal only with events which happened a fraction of a second after the Big Bang, and little is known for certain of how the Bang began (or what happened before it). There may be an easy way to observe this, however. It's my belief that the key to understanding the universe and its evolution can be found in the Mandelbrot Set, and by studying its intermediate stages of convergence. Understanding this fully involves grappling with the question of how dimensionality arises, and how the properties of space become established. Space was likely very different in character, when the universe had its origin, from the way space appears today. It is my working assumption that the geometry of space at its origin (near the Planck time) was noncommutative (explained below), and it's my observation that the steps taken to evolve conventional spaces (with a commutative geometry and algebra) provide all of the tools needed to create the Mandelbrot Set. 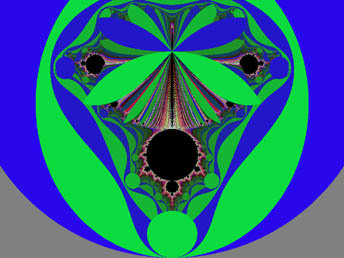 Specifically, the evolution of topological (having surfaces) objects and spaces, and the property of measurability, give rise to a vocabulary of concepts and processes sufficient to realize (or compute) the Mandelbrot Set. The form of the Mandelbrot Set itself allows us to chart the evolution of space beyond this point. The key concept of this theory is that the M-Set portrays the bounding surfaces which create symmetry-breaking, through the folding of space, and thus engender the fundamental forces with their familiar faces. A number of physicsists, including Paola Zizzi, have shown that the conditions of the early universe were sufficient to constitute a Quantum Computer. Knowing this can also be helpful to understanding this theory, in that it can explain how a mathematical object like the Mandelbrot Set could influence the universe's evolution before there were people with computers to explore it. If one examines the Mandelbrot function's behavior at the origin, or zero point, of the complex plane (0, 0i), one finds that this is an instantaneously, and infinitely repeating point. As one goes outward slightly, there are rings where the function repeats the same value after one or two cycles have occurred. The closest edge of the set is only .25 units away from the center, in the direction of positive, real numbers. This is at the cusp, or point, of the cardioid (heart-like) shape near the top of the figure. This cusp corresponds to the Planck Time, or 10-43 seconds into the Big Bang, according to this theory. The universe was expanding, at this point, but was still very, very small indeed. By conventional standards, the universe was quite tiny, almost infinitesmal. For all practical purposes, the universe could be said to occupy a single point. The understanding that is emerging, at this time, seems to be that the realm of the exceedingly small appears to have a geometry that is noncommutative, however. This means that the ordinary laws of size and distance do not apply. Simply put, distances don't add up, or can't be multiplied, when we examine space near the Planck scale. And they seem to vary on their own. It would seem, therefore, that reality began in a noncommutative space, but we now know that such spaces tend to evolve over time. It's almost as though distance and size don't matter, until space has assumed a particular dimension. There is seemingly some critical value, however, where size does matter. Once there is enough space to measure, it would appear, the conditions are ripe for the universe to expand and evolve. At the Planck time, the universe occupied a size of only about 10-33 cm, much smaller than the nucleus of an atom. Once the universe arrived at this size, and expanded beyond this point, the unfoldment of an entire universe of form was inevitable. The laws of Physics take over, once the threshold is crossed, and the familiar forms of those laws apply in increasingly greater measure, as the Big Bang proceeds and very soon after the universe begins to expand toward the familiar level of scale. A certain extent in space is apparently necessary, or a certain level of dimensionality, before the universe as we know it has the dimensions to expand into, or before physical law can take shape. Beyond that point, it seems that form appears automatically, or that the universe actively invites form to inhabit it. Likewise; the fundamental forces take on their familiar faces as things acquire measurability, taking on the property of size or dimension, and as the emerging universe of form takes shape. Similarly, the Mandelbrot Set exhibits complex behavior and develops detailed patterns of form only when a critical size, or distance, has been exceeded. All points on the complex plane within a radius of 1/4 from the origin (0, 0i) will converge under the Mandelbrot equation, or will not go to infinity no matter how many times the calculation is repeated. However, any positive real number greater than 1/4 will eventually escape all bounds, and fly to infinity, after a certain number of repeated iterations. 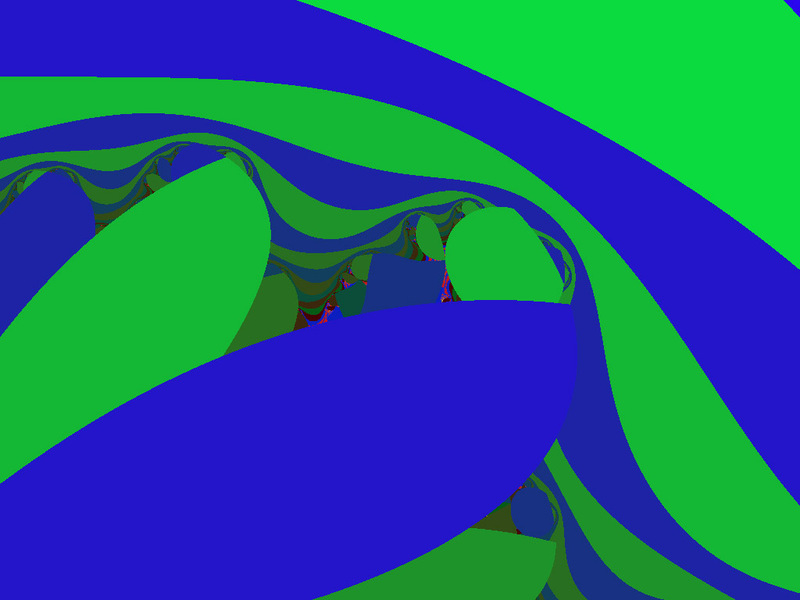 This happens at the cusp, a point which has no imaginary component, and a real number value of 0.25. Once one exceeds this critical value of (0.25, 0i), or simply a real value of one fourth, the Mandelbrot function gets larger with each successive iteration. 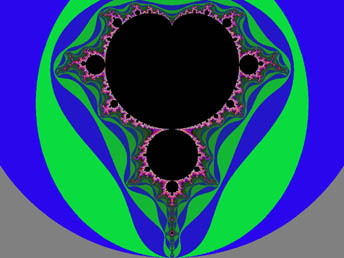 The dark body of the Mandelbrot Set seems to be drawn in toward the center (0,0i), at that point in the figure (-0.25,0i). It is at this point where the figure is perfectly symmetrical on the imaginary axis that we see symmetry broken for real numbers. We see that the left and right side of the image below are mirror images of each other. However, we see that the top and bottom are very different, in their character of form. Negative real numbers can be as large as -2, and still not grow out of bounds upon repeated iteration. But some points in the Mandelbrot Set neither fly to infinity, nor shrink away upon repeated iteration. Instead they arrive at some constant value, after a while (within any level of precision), and this value repeats endlessly. 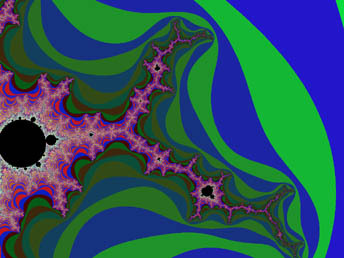 All of these points are part of the Mandelbrot Set, and all of the early repeaters fall within the main body of the Set. This can be clearly seen on the figure below with 1st and 2nd order Repeating Points highlighted (repetition with a period of one or two). What is shown highlighted in this image are those areas where the function repeats the last value, or the one immediately previous. 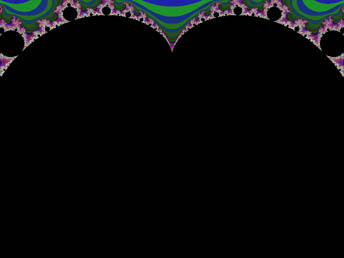 Near (0,0i) and (-1,0i) all points repeat after only a few iterations, but as one moves out toward the edges of the Mandelbrot Set, more and more iterations are required before the size value repeats. This figure seems to depict the luminous aspect of the universe, in terms of its vibrancy and expanding energy. The image was created by highlighting those areas displaying cyclical variation, which is characteristic of waves and wave-like phenomena. 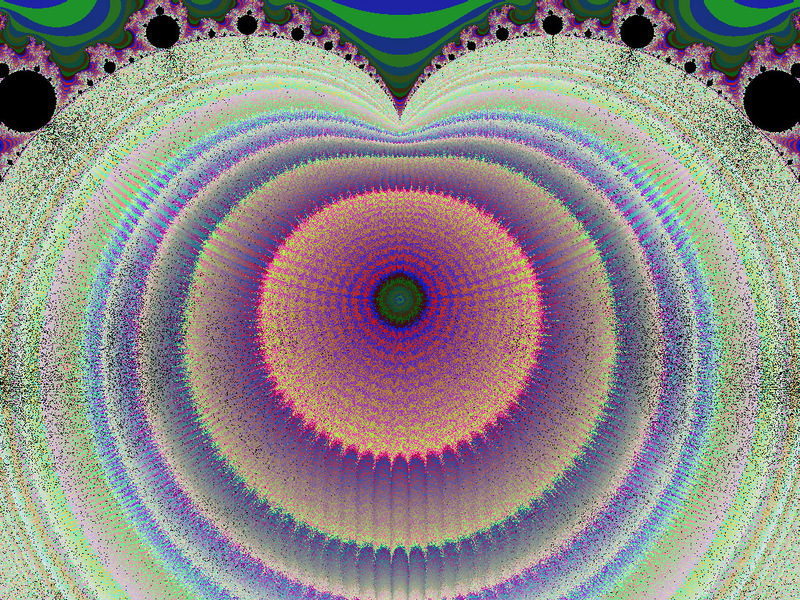 What the image reveals, in my view, is the purely wavelike nature of reality, rendered as a halo within the Mandelbrot Set. If one examines the cardioid, or heart shaped, region in the upper half of the image above, it is easy to imagine that the repeating points are a ball of energy expanding outward from the origin, toward the edges of the set. However, as it expands, its symmetry is broken. What we see is that this expansion starts in roughly concentric circles, but as the expansion proceeds toward the cusp these cirlces become more and more dimpled, and morph gradually into a cardioid-like shape. It is notable, however, that there appear to be holes in that shape, which do not resolve even at very-high iterations. These spaces appear, in the halo, in the region near each bulb (except for the largest circular region), with the magnitude of the corresponding missing spaces depending on its size. If one were to create waves in a liquid, within a Mandelbrot shaped vessel and starting at the point of origin, these waves would break against the cusp and be forced to go one way or the other. This is another kind of broken symmetry, as the energy from waves is swept into clockwise motion on the right, and counter-clockwise motion on the left. The different-sized bulbs (or voids) around the periphery also serve as a kind of filter for various wavelengths of vibration. In the enlarged image above, one can see all of the detail described in the preceeding paragraph, but there is also another feature to describe. There are radiating spokes extending out from the center, that seem to reach toward some bulbs and avoid others. In the central region, these spokes appear fairly evenly spaced, but successive color bands seem to have more, and more of them. As these spokes approach the periphery of the object they appear to bend toward the edge, as though they are trying to approach it from a perfect right angle, or perhaps to exactly match the angle of the bulb or void it is approaching. If the expanding energy ball of the early universe is represented by the repeating points, then the radiating spokes may correspond to the angular variations we observe in the Cosmic Microwave Background radation, and the density variations in the expanding fireball. I have not attempted to quantify specific correspondences, however. But having only examined the repetitive and cyclical nature, or wave-like aspect, we must now look to its complement, the substantial part of the equation and the particle-like aspect. Does the Mandelbrot Set offer us insight into how matter arises, as well? It seems that it does indeed. It give us a lot of information about this aspect of the universe's birth too. 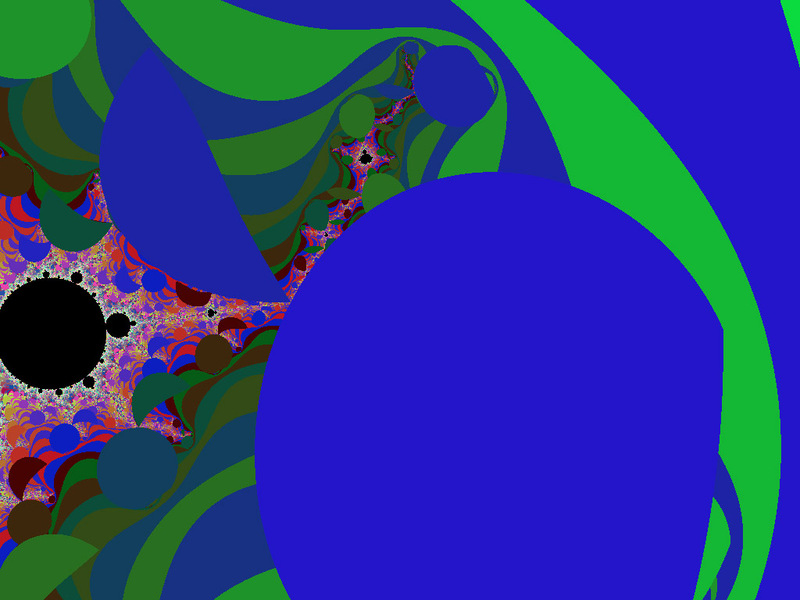 The particle-like aspect, which constitutes the protons, neutrons, and electrons that comprise our bodies and planet, can be seen in the disks around the periphery of the Mandelbrot Fractal Butterfly figure above. This figure highlights areas with diminishing size (of the dynamical variable). If we magnify the same area of the M-Set as in the previous paragraph, one observes that the ands at the uppermost tips of the butterfly wings curve toward the cusp from either side to approach the surface from an angle of about forty-five degrees. However the points on these wing-like figures are blunt and in this area the upper and lower faces come together at an angle slightly in excess of 90 degrees. These bands require many fewer iterations, or computational cycles, to resolve than either the repeating size function, the Mandelbrot points, or the surrounding repeller sets. The image below required only a few minutes to calculate, where the repeating points image of the same area took over an hour. In the part of the set near the cusp, the Butterfly wings appear to overlie the detail around the edge of the set, obscuring it entirely. All of the bulbs around the slope of the cusp have been completely covered over. What does this imply? If those wings depict energy exchanges, this would imply that the early universe was too hot for objective form to congeal. The primal energy itself would push out the boundaries of space, and energy bands would sweep away any form before it had a chance to emerge. This is reasonably consistent with accepted cosmology theory. The fact that these wing-like structures require less time or energy to resolve, or calculate, as compared to the alternative forms which they overlie or displace, is significant in terms of how the Mandelbrot Set might encode quantum probability, for early events. Form in our universe will normally assume the shape, or state, which allows it to use, or occupy, the least energy. In other words, a wood block on its edge, rather than on its side or its end, is more stable. Water would rather flow downhill than sit on top of the hill, but it will collect in a lake or pond. Crystals form because they allow dissolved minerals to give up some of their energy, and relax into a stable configuration. The ability of form in the primeval universe to soak up Energy into shapes of Matter requires this form to be favorable to, or somehow easier to attain, than alternatives. Easier, that is, than simply remaining energy. So; when considering what makes particles emerge from a sea of energy, we can reasonably assume that the shapes they assume are easier to maintain than it is for them to revert back to pure energy. The favorability of one form over another may depend upon the shape of bounding objects, as when water fills a pond, or upon properties contained within that which is assuming form, as when water becomes a snowflake. In most cases, the form assumed will be more orderly, or at a lower energy than the amorphous state, or whatever form it is replacing, and this is a key point to consider. What causes matter to congeal from energy in the first place? It could be that the very possibility for energy to assume form is enough to make it happen. But it would be just as likely for the shape assumed to transform back into energy, unless there is an advantage to a particular formation, though it wouldn't stay that way for long, so long as it was hot enough. The image below is a magnification of the Mandelbrot Fractal Butterfly figure, around the right-hand arc from the cusp, with discs emerging from behind the butterfly wings. Could this depict the first sub-atomic particles tentatively emerging from the energy 'soup' of the universe's earliest moments? The early universe was very much like this; it was full of energy with exotic forms so fleeting as to be almost impossible to re-create in the laboratory. Even our most powerful particle accelerators are far shy of the energies needed to create the earliest and heaviest particles. When stable sub-atomic particles finally did emerge from the energy soup, this allowed some of the energy of the Big-Bang to be encapsulated in form. We imagine that the earliest moments of the universe contained free strings and quarks that were not bound into particles, but the tendency exists for energy to flow in circuits. If a specific form allows loops of energy to relax into a lower energy state, this can be a more stable configuration. In the earliest moments of the universe, however, the opportunity for this to happen did not exist, or rather didn't last for long as energy was so greatly predominant over matter, and the universe had to expand and cool a bit, in order to allow form as we know it to completely coalesce. At some critical moment, the Color Force, or Strong Nuclear Force, went into action - binding energy into sub-atomic particles. First were predominantly heavy particles from a group known as Hadrons, which includes Protons, Antiprotons, and Neutrons among others. As one goes outward, along the edge of the Mandelbrot Butterfly, toward either (0, i) or (0, -i), there is an emergence of independent forms, which look more like a circle or disk as you go around the curve. In addition to the disks, there are other forms which are more like a segment or a fragment (e.g. - a crescent moon) thereof. If one examines the Mandelbrot Set in the area (see image above) near either of these points (+i or -i), one will see shapes that are very reminiscent of the tracks in a bubble chamber, or some other particle detector, connected to a particle accelerator. Looking at the Fractal Butterfly in the same region (as in the image below), one can easily imagine that the circular forms we observe are the particles which are participants (materials) or reaction products in sub-atomic interactions, and the threads connecting mini replicas are the reaction (or energy) paths of those interactions. At these points on the figure (near i or -i), it appears to be the Strong Nuclear Force (or the Color force) which is mainly depicted, and the creation of the first stable sub-atomic particles involving the primal energy, by binding it into independent or free-standing forms. If we zoom out slightly, we can see that there is what appears to be a particle nursery of sorts, in this part of the Set. Note that the discs are not competely circular, but rather they are squashed, and they have a piece missing on the side facing away from the body of the Mandelbrot Set. If we compare this to the mode of action of the strong nuclear force, there is a parallel. When the strong force binds sub-atomic particles to form atomic nuclei, the individual particles give up some of their mass to form a single entity (the nucleus) that binds to itself. The color force, which is the precursor of the strong force acting to bind the sub-atomic particles themselves, is presumed to act in a similar manner. The correspondence here is that regions that are almost circular in shape are areas of enhanced probability, according to Mandelbrot Cosmology. The implication here is that the ease of computing the disc-shaped regions of the Fractal Butterfly figure seems to represent the tendency for energy to congeal into particles, because such forms can be manifested with greater ease than the alternatives. The initial binding of energy into stable particles of form (Hadrons) took place during the first millisecond of the universe, according to Big Bang Cosmology (and most of its variations). When a certain time had passed, the relatively heavy particles were once again swept away by bands of energy in exchanges which resulted in the annihilation of most of these particles. To a large degree, lighter particles (Leptons) began to predominate, at that point in the evolution of the universe, and other interesting things began to happen. If you examine the behavior of the form along the edge of the Butterfly figure, as it swings around the corner of the cardioid (past +i and -i), the ending of the Hadronic Era (by more wing-like figures) is clearly depicted, where the effects of the Strong Nuclear Force give way to other forces, and the next phase or cosmological era begins. I take this era up in the next chapter of this essay, The Mandelbrot Set and Cosmology, entitled Approaching Decoupling - the Matter/Energy Cloud Expands.